Waive vs. Wave – What’s the Difference? Home » Waive vs. Wave – What’s the Difference? In English, homophones are words that are pronounced the same way but do not mean the same thing. Many homophones are different parts of speech. Waive and wave can both be used as a verb, but only one can be used as a noun. In spoken English, we can use context to determine which word is being used, but these words become more confusing in writing, especially as verbs. In this article, I will show you how to tell the difference between these two verbs. Is it waive or wave? Continue reading to find out. What is the Difference Between Waive and Wave? In this post, I will compare waive vs. wave. I will use each word in an example sentence, so you can see it in its proper context. Plus, I will give you a helpful memory tool you can use to remember whether wave or waive is what you mean. What does waive mean? Waive is a verb. It means to decline to exercise a rule or right. 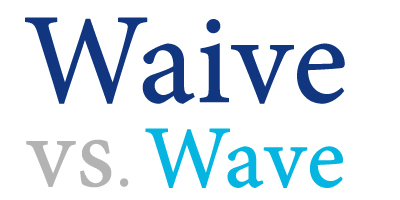 Waive is often used in legal contexts. By signing this agreement, you waive your right to sue the ski lodge for any injuries you may suffer. The chancellor will waive the obscure debate rules for certain political favors. “I waive my claim to the throne, in favor of my younger brother,” said the princess. Waive is used in a few common phrases. To waive your rights: refrain from insisting on or using a right or claim. He is waiving his right to an attorney. To waive the fee: refrain from applying of enforcing a rule. Despite the late payment, his fees were waived. What does wave mean? Wave can be a noun or a verb. As a noun, wave means a hand signal, often used as a type of greeting, or water that crashes against the shore. In this second sense, it can also be used metaphorically to mean any powerful force. The beauty contestant greeted the judges with a dainty, practiced wave. “I want to go swimming, but the waves are too high,” said Carmondy. A wave of resistance swept the corrupt dictator from power, but it installed an inexperienced idealist in his place. Like waive, wave can also be a verb. As a verb, wave means to gesture with one’s hand or to shake something back and forth as a gesture. It could also mean to flutter in the wind. The tattered flag waved on the flagpole, a forlorn tribute to simpler times. Joey blushed when Christina waved to him from across the lunchroom. “How do you explain these?” Kaylee asked, waving the receipts in Armando’s face. Wave is used in many more phrases than is waive. Here are a few of the more common ones. The wave: popular at sport events when people stand up to create illusion of a wave going around the stadium. To make waves: to create a significant impression; to cause trouble. To wave something aside: to dismiss something as unnecessary or irrelevant. To wave someone down: to get the attention of someone. Here is a helpful trick to remember wave vs. waive. Both wave and waive can be verbs, but only wave is a noun. As a verb, the picture becomes murkier. Remember that waive means to relinquish a right. Since waive contains the letter I, you can use all the I’s in the sentence “I waive my rights” to remember the most common context for this verb. Is it waive or wave? Waive and wave are both verbs. Only wave is also a noun. To waive is to relinquish ones’ rights. To wave is to move your hand back and forth. Wave is also a body of curling water. You can use the I in waive and the sentence “I waive my rights” as a reminder of this word’s meaning. Waive means to relinquish a right. Wave means to signal with something. 1 What is the Difference Between Waive and Wave?